Provides a matte, no shine finish. Finishes with a non-greasy and dry-to-the-touch feel. Blended with vitamin E and aloe to nourish and restore leather. Advanced UV blockers help protect leather from harsh sunlight. Perfect for natural leather, vinyl, leather, and durable sealed leather pieces. 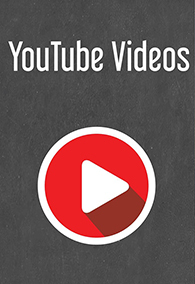 Works on all leather colors in the car, home, office, and beyond. Easy-to-use sprayable formula works anywhere, any time. 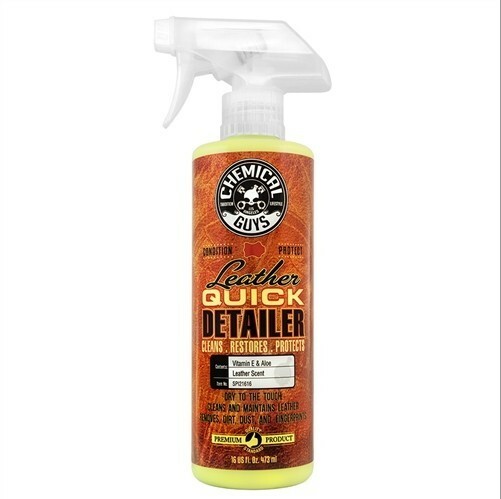 Chemical Guys Leather Detailer cleans and maintains the original condition of leather seats, upholstery, apparel, and accessories. The sprayable formula easily removes dirt, dust, fingerprints, and light stains from leather surfaces. leather Detailer is perfect for detailing leather seats, door panels, dashboards, steering wheels, shift knobs, and custom leather goods. The easy-to-use leather detailer is non-greasy with no slippery feel or greasy shine. Simply spray on the leather surfaces and wipe away using a microfiber towel. It’s that easy! 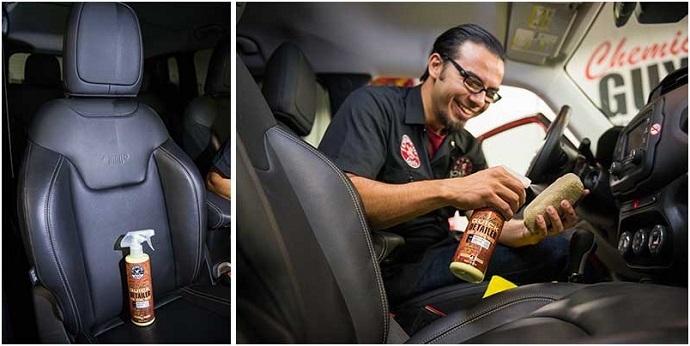 leather detailer safely cleans and maintains leather surfaces for instant results. leather Detailer is formulated with vitamin E and aloe to maintain and preserve the original look and feel of leather. The innovative leather Detailer quickly removes spills from leather before they can stain and cause permanent damage. leather Detailer is easy to use for cleaning leather on the go. Keep a bottle in the car for easy detailing anywhere, any time. Clean, restore, and protect leather goods with Chemical Guys leather Detailer. Leather is a natural animal hide that has been tanned, dried, and conditioned for automobile upholstery. Over time, leather can become dry, stained, discolored, and cracked from neglect. Leather Detailer is formulated to safely maintain the original condition of leather upholstery and goods. Body oils, food stains, and UV sunlight can wear down the condition of leather, destroying the hide or leaving it with greasy stains and spots. leather Detailer easily removes unwanted body oils and food stains that destroy the look and feel of fine leather. Light cleaners remove unwanted contamination to maintain the purity of the leather surface. The sprayable detailer lifts dirt, dust, fingerprints, and body oils from the leather surface without harming the color or feel. Vitamin E and natural Aloe extracts nourish and restore the soft supple feel to leather goods to help prevent cracking and fading from normal use. 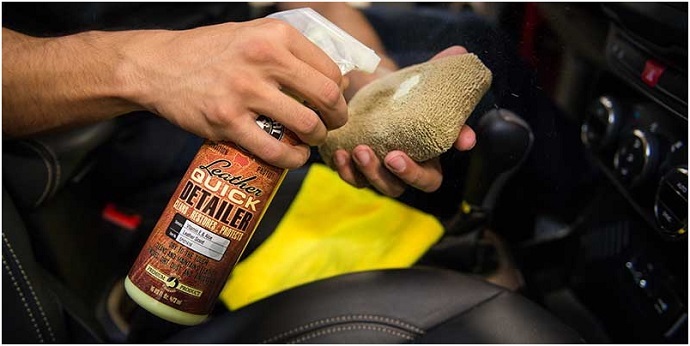 leather Detailer is easy to use during a full detail, during regular weekly washing, or while on the go whenever your leather requires detailing.